The building contractors seen here are no longer four individual tradespeople – they have become a single well-oiled machine. 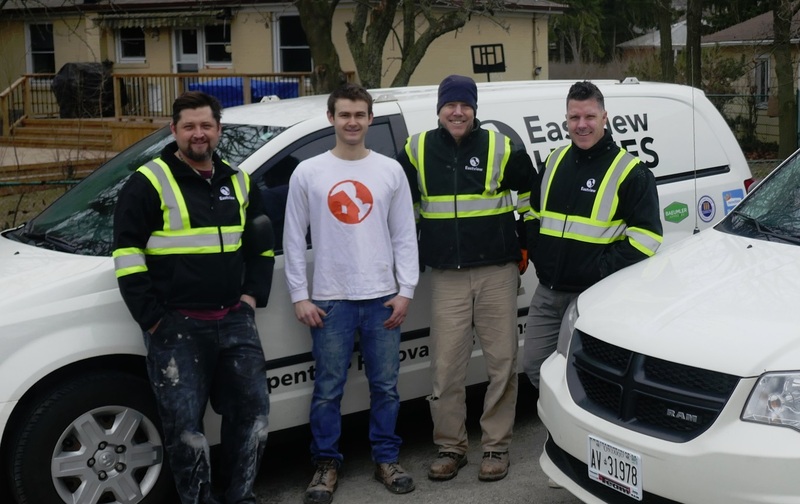 We are Eastview Homes, and here are the ‘core four’ specialists in our design build squad. Each of these hammer wielding heroes is an expert at something specific on top of being a skilled carpenter. One of the challenges that modern day contractors face in these turbulent times is keeping a skilled crew together so they improve as they experience new tasks together. Its all well and good to find master craftspeople from here, there and overseas, but if their production methods are counter to your staff’s accepted protocols, then the stage is set for confusion and conflict. At Eastview Homes, we try our best to keep our master craftsmen happy and in lock-step, glued together from one job to the next. Everything we do makes us stronger, wiser and better prepared for the next challenge, and the next time we encounter similar tasks. From left to right are Adam, Matt, Dean and Keith. Adam is a carpenter with 15 years experience, and his special skills include framing and finishing interior and exterior walls. He’s a real pro at making perfect exterior finishes with a special affinity for vinyl or aluminum siding. And inside the house, he eats drywall dust while doing his level best to keep all subcontractors in line with the high bar he sets surfacing the most difficult spots in the house. Matt is the youngest technician on the crew, and is the wheels of the operation. He’s young and strong. At the beginning of most renovations, during the demolition phase, he transforms into a demon with a sledgehammer. Matt is now three years into his Carpenters Apprentice ticket, with five years carpentry experience total. He’s a born natural though, and already highly skilled in finish carpentry and concrete finishing. Dean is the wise owl who watches over the whole site. He’s a very experienced design-build carpenter with over thirty years experience in general carpentry. Dean has been around the longest and is filled with local lore about what used to be here and there, and how things used to be done a certain way. But far from being a close-minded curmudgeon, Dean is probably the crew member most open to new ideas and trying new things. He still occasionally teaches a class in Architectural Design at Ryerson, and that’s primarily because of his resume; his west coast construction company built four venues for the 1994 Commonwealth Games in Victoria BC along with many other notable buildings in that province. And finally the crew boss, Keith Travers is an intuitive journeyman carpenter with twenty two years of experience in general carpentry with a natural aptitude for framing and finishing jobs. Keith deals with clients, and sub-contracts the vast array of other highly specialized tradespeople needed to complete a modern construction project. When homeowners call Keith before they have blueprints, which is almost always the case, it will be his vision, conceived under the homeowner’s direction, that ultimately comes to life at each job site. You can read more about Keith Travers at Eastview Homes in the very first post on this blog.